Trust us, we did some deep digging, from our own couch. Couch shopping has gotten a lot simpler than it used to be. Now, without leaving your bed, you can choose the perfect couch in a fabric that works with your style, and get it delivered to your front step. How cool is that? Thanks internet! We made it even easier to know the couch you are getting is not only stylish, but safe. 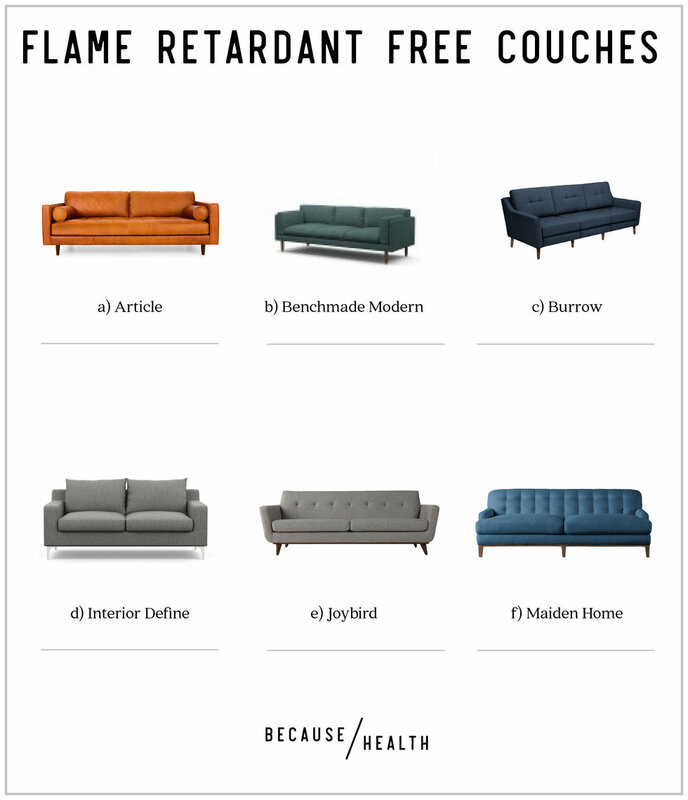 We scoured the websites, contacted their customer support, and rounded up 6 online couches companies that are for sure free of flame retardants. Now you have less to worry about when it comes to all your nights of Netflix and chill (which for us is like every night, that's normal, right?). Article furniture has a mid-century, Scandinavian aesthetic, that we can't get over. Those simple lines, yes please! And we can't help but get those heart eyes at the fact that they don't add any flame retardants to their fabrics or foam. Want a couch for that quirky nook or extra large living room? We love how you can customize the size of sofas from Benchmade modern (from 60 to 120 inches) in 60+ color choices. All options without flame retardants. With Burrow's modular couch, you never have to worry about it fitting it in your next apartment or needing to hiring movers to move it. The design is so clever, and bonus points since they are made without flame retardants. A friendly customer service rep confirmed that this means all types of flame retardants. We are digging the high-end designs of Interior Define's couches almost as much as their declaration of being flame retardant free. Joybird has SO MANY great mid-century styles you can pick from - good luck choosing. One choice you don't have to make is flame retardant free. We confirmed with a customer service rep that although they only refer to one specific type of flame retardants (PBDEs) on their site, their fabrics and foams do not contain any flame retardants at all. This impeccably edited assortment of sofas and chairs will make any style-conscious shopper swoon. Thankfully, being style-conscious is also health-conscious with Maiden Home's flame retardant free furniture.